Dow Chemical Paid Trump $1M to OK Chlorpyrifos Chemicals Despite Neurological Side Effects-Truth! & Disputed! - Truth or Fiction? Dow Chemical Paid Trump $1M to OK Chlorpyrifos Chemicals Despite Neurological Side Effects-Truth! & Disputed! Dow Chemical Paid Trump $1M to OK Chlorpyrifos Chemicals-Truth! & Disputed! President Donald Trump allowed the use of chlorpyrifos in chemical pesticides because Dow Chemical paid him $1 million. The Trump administration reversed an Obama-era ruling on the health risks chlorpyrifos poses to humans. But the Trump administration attributes its decision to unclear science — not a $1 million payment from Dow Chemical. Chlorpyrifos is used as an insecticide to control termites, mosquitos, roundworms and other insects. The chemical functions as a nerve agent. It blocks enzymes that control messages between nerve cells, killing pests. First registered for use in the United States in 1965, EPA re-registered the chemical in 2006, the National Pesticide Information Center (NPIC) reports. Legal action initiated is the source of recent debate on chlorpyrifos. The Pesticide Action Network North America (PANNA) and Natural Resources Defense Council filed an administrative petition with the EPA in 2007. The groups petitioned EPA to revoke all food tolerances, and to cancel all registrations, of chlorpyrifos. After seven years without action, PANNA petitioned the U.S. Court of Appeals Ninth Circuit in 2014 to compel EPA to issue a final response. EPA was ordered to issue a preliminary decision in 2015, and to take final action by March 31, 2017. The Trump administration denied the petition in March 2017 — a reversal from the Obama administration’s position. That led to speculation that Trump’s decision was motivated by a $1 million payment from Dow Chemical. As a result of PANNA’s lawsuit, EPA reviewed human health risk assessments (HRRA) for chlorpyrifos in 2011 and 2014. The ladder HHRA review analyzed new information on chlorpyrifos that found human exposure to the chemical was not safe at levels allowed under current law. In response, EPA published notice of a proposed rule to revoke “all tolerances of chlorpyrifos” in 2015. And, in November 2016, EPA issued a final revised HRRA for chlorpyrifos. It concluded that humans are exposed to harmful levels of chlorpyrifos in food and drinking water under current standards. One study cited in the revised HRRA demonstrated that chlorpyrifos was present in 87 percent of umbilical cords tested. Other studies linked exposure to the chemical to lung cancer and Parkinson’s disease. The November 2016 HRRA for chlorpyrifos found “sufficient evidence that there are neurodevelopmental effects occurring at chlorpyrifos exposure levels below that required for” inhibiting brain enzymes. A final rule wasn’t published with the March 31, 2017 deadline looming, however. EPA Administrator Scott Pruitt announced in March 2017 that PANNA’s petition to revoke all tolerances and registrations of chlorpyrifos had been denied. EPA has concluded that, despite several years of study, the science addressing neurodevelopmental effects remains unresolved and that further evaluation of the science during the remaining time for completion of registration review is warranted to achieve greater certainty as to whether the potential exists for adverse neurodevelopmental effects to occur from current human exposures to chlorpyrifos. EPA has therefore concluded that it will not complete the human health portion of the registration review or any associated tolerance revocation of chlorpyrifos without first attempting to come to a clearer scientific resolution on those issues. Congress had given EPA until 2022 to complete its registration review of chlorpyrifos, the order states. Because the Ninth Circuit made clear that no deadline extensions would be provided, EPA denied all remaining claims. PANNA appealed the EPA’s decision to the Ninth Circuit. In July, the panel denied the appeal. The court ruled that PANNA must exhaust EPA’s administrative appeal process before taking the case to court. Controversy followed the Trump administration’s action on chlorpyrifos in March 2017. 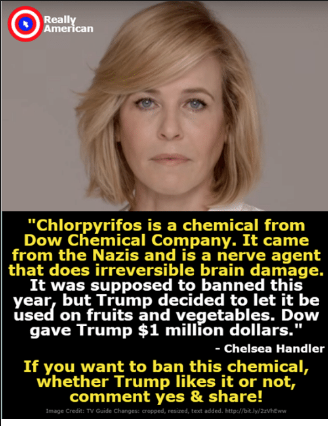 Chlorpyrifos is a chemical from Dow Chemical Company. It came from the nazis and is a nerve agent that does irreversible brain damage. It was supposed to banned this year, but trump decided to let it be used on fruits and vegetables. Dow gave trump 1 million dollars. Handlers’ tweet was shared nearly 50,000 times within two days. Her comment appeared on a meme that was widely shared on social media and in discussion forums. This marked the first exposure to chlorpyrifos regulatory issues for many people. A meme about the Trump administration’s decision not to ban chlorpyrifos went viral in November 2017. Sandra Bullock to Hillary Clinton: If You Don't Like Our President, You Can Leave-Fiction! Democratic Livermore Mayor Marshall Kamena on Donald Trump-Incorrect Attribution!